From the internationally bestselling author Fiona McArthur comes a heartfelt story of family ties, the power of love and the passion of ordinary people achieving extraordinary things. When the father she barely knew dies suddenly, midwife Eve Wilson decides she owes it to him to go to the funeral and meet her stepfamily in Red Sand. She doesn't expect to be so completely charmed by the beautiful remote township in far west Queensland - or by local station owner, Lex McKay. After disappointment and heartbreak in Sydney, Dr Callie Wilson doesn't hesitate to move home and spend some time with her grieving mother. When she is approached to oversee the establishment of the area's first medical clinic, it seems the perfect opportunity. And Callie is keen to involve Eve, the sister she's just getting to know. 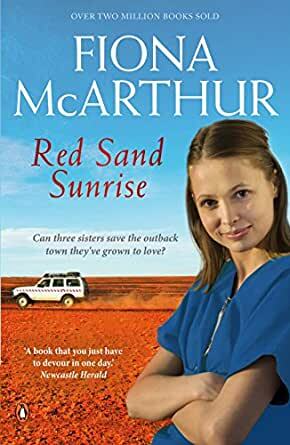 Melbourne-based obstetrician Sienna Wilson can't understand why anyone would want to bury themselves in the outback, but when her hospital sends her north to research the medical mystery affecting women in Red Sand, it seems fate is intent on bringing the three sisters together.� And when disaster strikes, they must each decide if being true to themselves means being there for each other . . .
5.0 out of 5 starsThis book is really good Australian reading, well written. This novel was well written and had a lot of warm fuzzy moments. It was a pleasure to read an Australian story written in such a way that you knew the Author was acquainted with both her topic as well as the Australian out-back where most of this novel is based. I usually don't read 'romance' novels, and doubted my choice in buying this e-book. However, I was very pleasantly surprised with how the Author covered the 'romantic bits' and nothing was missed in the interpretation. A pity a lot of other Authors don't follow suit. The medical areas were well documented and though it does seem a little fanciful to place such an expensive medical centre in that location, I guess it was as good as anywhere, really. Do yourself a favour, this book is really good Australian reading. 5.0 out of 5 starsAwesome read of love, betrayal and outback medical heroes. I loved the story line, love how the families reunited and became one, how they shared each other's pain and laughter, the drama's of love and decisions. But medically in the outback and pregnancy all wrapped into a feel good story and the fact that we have the opportunity to have some realism into what can go wrong and how the medics, RFDS and emergency crews help out to save lives when we are all on the road leading to somewhere. I have never read this author before but will be looking for new romances under her name. Well done! I just wish we had read of Sienna staying with her extended family and the hot cop. I was hooked from the moment I started. As is her usual way, her characters are likeable or at least as likeable as she wants them to be. Her ability to make you picture exactly what she wants you to see is incredible. I enjoyed reading and learning from this book. the description of the landscape was great and the information about women s health was very well done.